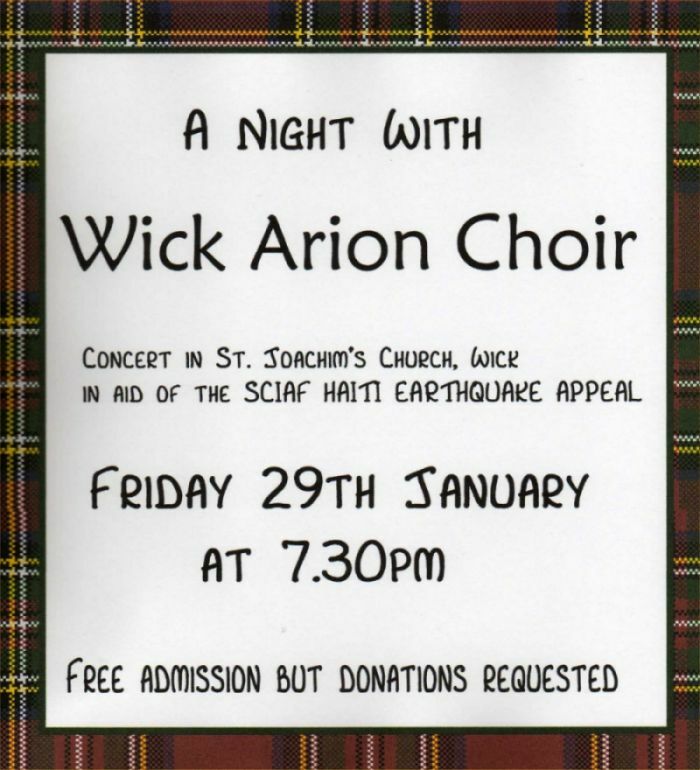 On a bitterly cold night on Friday 29th January the public turned out to a free concert in St Joachim's church, Wick and made donations at the door totalling £956 towards helping the people of Haiti. After some great singing from the choir of many familiar Scottish tunes including several Burns songs the audience were surprised to be invited to an amazing buffet that had been laid on without notice. Great home baking a huge range of scrummy cakes and sandwiches. Tea, coffee and even a glass of wine were on offer. It transpires that Sister Declan who used to be based in Wick for several years has for the past couple of years been working in Haiti. The house she was living in was demolished in the earthquake but she survived and is currently living in a tent whilst helping the community there. The local Mod organising committee are now well into the run up to the Caithness Mod 2010 - a massive logistical exercise to accommodate up to 9000 visitors to the county in the nine days Friday 8th - Saturday 16th October. Our section that carried some early information has now been cleared out into an archive page and a link to the new official Caithness Mod web site that is coming shortly. Other indications as to the scale of the vent can be found on the Bebo page where you can read about the involvement and tuition going on in local Caithness schools for young musicians and singers. The Caithness Mod 2010 also has a Facebook page You can join these pages to be kept up to date with all the latest news in coming months as we get closer to the biggest music event that has ever happened in Caithness. For folk looking to attend from outwith the county you better get cracking to book somewhere to stay as areas with the Mod tend to get booked quickly. Anyone with any questions can get in touch with Carol-Anne MacKay recently appointed as the full time event support officer carolannemackay@hotmail.com Carol-Ann will also help if anyone ahs problems finding somewhere to stay. Old Pulteney single malt whisky has helped a separated Cape Wrath couple celebrate their reunion this week with a bottle of their whisky from their Wick-based distillery. John and Kay Ure, who run an isolated tea room in the UK mainland's most north-westerly tip, were forced to spend the festive season apart for the first time in 35 years when the 'big freeze' hit in December. Upon hearing of their predicament Scotland's most northerly distillery overcame the elements to present the reunited couple with a bottle of Old Pulteney 12 year old single malt to belatedly toast the New Year together. Limited places are now available on a new course running at the North Highland College, in our recycling centre. Flexible hours are available. An open invitation for consultants, contractors and skilled trades businesses to submit an application to work for The Highland Council on contracts with an individual value of up to £25,000 and consultancy work for projects of all values has received a considerable response. Over 700 (476 contractors and 242 consultants) submitted an application by the deadline of Friday 22 January for the Council's framework agreement which will begin in April 2010 and will last for two years, with the option of a one-year extension. Marine Energy has long been talked about but now something is stirring as the Envronmental Research Institute in Thurso announce research jobs in both Thurso and Oban for a research programme. The Highlands and Islands of Scotland have some of the world's best natural resources for marine renewable energy. These provide unrivalled opportunities for developing new energy markets and the ‘green economy’ in the coming years. The Environmental Research Institute (ERI) of the North Highland College in Thurso together with the Scottish Association for Marine Science (SAMS) in Oban, have successfully secured £4million funding for a unique multi-disciplinary research programme, Marine Renewable Energy and the Environment (MaREE). 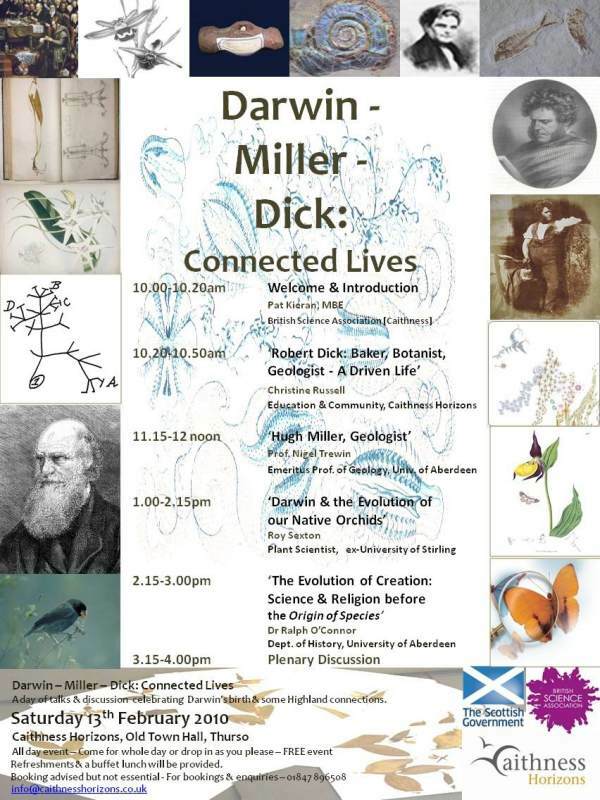 Both organisations are partners in the UHI Millennium Institute (UHI); the ‘emergent university of the Highlands and Islands’. 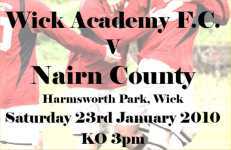 Rothes V WAFC has been cancelled on Sat 23rd Jan and now WAFC has a home match against Nairn County KO 3pm. 1st Prize will be a package of art materials for you, a digital camera for your school and a free session for your class at the Clan Gunn Heritage Centre in Latheron, Caithness. The winners will be awarded their prizes at the Gathering and Halkirk Highland Games in the summer. Closing Date Friday 2nd April 2010. Home In The Highlands has also posted three updates since the turn of the year once again reflecting on the Caithness landscape and a few thoughts on this and that from an American resident in the county. Need some time out? - Want to learn to relax? The Highland Council's Education Culture and Sport Committee has agreed to review its school estate, which includes 183 primary schools; 29 secondary schools and 3 special schools. The New Year is in full swing and to celebrate, the Body Currents dance programme, run by Eden Court, is launching their new range of exciting classes in Caithness this week for all ages and all abilities. Caithness-based Dance Catalysts, Jill Kingdon and Juta Campbell, who run the outreach programme in the area and host each class, have compiled a programme full of diversity that would make Len Goodman proud. Kicking off with a dance taster sessions on Thursday 21 January at Reay Hall, and Friday 22nd January at Castletown Drill Hall, Jill and Juta will introduce beginners to a mixture of different dance styles including Street, African, Breakin', Salsa and Rock'n Roll. The classes are aimed at everyone from six to ninety six no matter what the skill level. Saturday 23rd January will see a Day of Dance at Mey Hall, where the Dance Catalysts will be teaching a variety of different dance styles including Hip Hop, Salsa, African, Jazz, Musical Theatre and Creative Dance. Starting at 10:00am and running through until 3:00pm, the day will be full of fast-paced fun for all the family. On Monday 25th January, Jill and Juta will host the first parent and baby taster session at Lybster Community Hall. Aimed at little ones aged from birth to 24 months, the class will give Mums and Dads the chance to dance and move with their baby to playful tunes and nursery rhymes. There will also be Parent and Baby taster sessions in Wick on Tuesday 2nd February and in Thurso on Monday 8th Feb.
More wintry photos - this time from Lybster showing how the village side roads became like a skating rink last week. 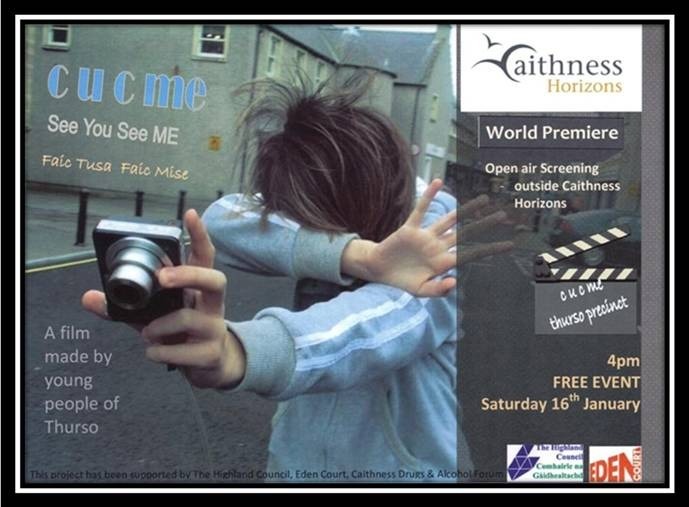 Film Artist Gavin Lockhart, David Hunter [Eden Court drama worker], & Christine Russell, [education & community officer for Caithness Horizons] will join the Young Film makers themselves to answer any questions you might have about this original Highland Culture Programme project by Caithness Horizons, Thurso. The Building will be closing for maintenance work from Monday 1st February, re-opening on Monday 15th. POLICE and emergency services are attending a collision between a passenger train and a van at a level crossing on the B874, Halkirk. 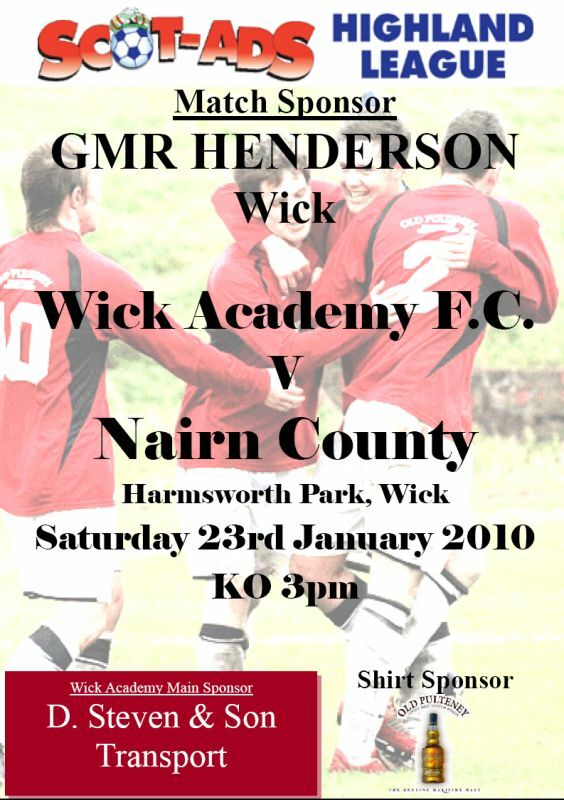 The incident was reported at 11:45am this morning, 9 January 2010. The passenger train was carrying 5 passengers and 3 members of staff, none of whom sustained any injuries. The van driver was cut free from the van which was trapped at the scene. He was taken to Caithness General Hospital for medical treatment for minor injuries. British Transport Police are sending officers to the scene. Dunnet Forestry Trust regrets that it has to postpone the wood/log sale that was to be held at the forest this Saturday, 9th January. This is due to the severe cold weather conditions making the approach road and the industrial area highly dangerous, the whole access area is a thick sheet of ice which could be lethal to users; instead the sale will be held the following Saturday, 16th January 10am - 1pm. Any customer desperately needing logs before the 16th should ring 01847 851 353, if access is safer, a convenient pick up time will be arranged. Weather conditions: Limited snowfall has allowed wider treatment of priority 3 and 4 routes. Very cold temperatures overnight (-23 in Altnaharra. Ice now likely to be the problem. The forecast is for very cold weather over the next couple of days. Salt has a limited affect below -9 and grit will be used on the roads over the coming days. A major focus of snow clearing has also been in freeing entrances to schools. Private contractors have been hired to assist with the snow clearing operation. Salt Supplies: A consignment of 3,400 tonnes of salt arrived at Invergordon Harbour this morning and a further 2,000 tonnes are due to arrive at Inverness Harbour over the weekend. Every effort will be made to ensure Highland schools are able to open after the holidays on Monday 11 January, despite the adverse weather. Parents are asked to check the schools’ web site: www.schoolclosures.highlandschools.org.uk or call the schools’ information line, which gives callers access to the latest pre-recorded messages from head teachers. The telephone number is 0870 054 6999 + the school's PIN* - List of schools' unique 6-figure PIN numbers (PDF document - get free PDF reader software from the Adobe website). Parents should also listen to Moray Firth Radio and BBC Highland on Monday for a note of school closures. TEC Services have engaged the use of private contractors to clear access to schools. Priority is being given to secondary schools and special schools and then primary schools. The Council has 29 secondary schools with 14,767 pupils; 183 primary schools with 16,821 pupils and 5 special schools with 156 pupils. This gives a total of 31,744 pupils. The Highland Council is responding to the high number of enquiries received from the public about the bad weather to open its Customers Service Centre this weekend. The Centre will be operational between 9 am - 5 pm on both Saturday and Sunday. The number is 01349 886606. The Service Centre, which is based in Alness, has dealt with an average of more than 1,700 calls each day since Monday 4 January. This is a rise of 15%. The public is asked to use this number if they have queries about school openings and roads and housing issues. Northern Constabulary are issuing safety advice to members of the public following a warning of possible freezing rain in parts of the Highlands and Islands tonight and tomorrow. Freezing rain is very hazardous in that the precipitation falls as rain but freezes on contact with the ground. This could potentially make walking and driving conditions more dangerous than at present. Due to the cold weather the Wick library will not stay open as it usually does until 8.00pm.